Transition Towns is a proposal for building local resilience regarding to Climate Change (CC) and Peak-oil in urban spaces. Performing a review of its discourses and practices, this paper is focused in the examination of the experiences of individual and collective Agency through the lenses of Everyday Politics and Theories of Change. 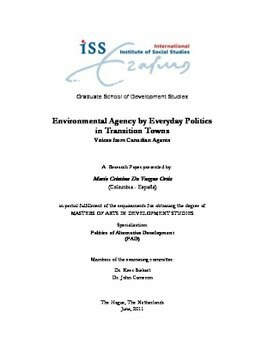 In this line, reflections around incentives and constraints for greater environmental agency, as well as contents related to politics and development are examined through the voices of agents in eastern Canada. The author argues that these kind of post-carbon initiatives deserve a close look, because they can help in the identification of paths to diminish the clash between environment and development, also revealing important elements to promote a greater engagement within environmental agency. Perhaps, many questions remain open around the effectiveness and possibilities to influence decision-makers from these examples of alternative development. However, they are in a pathway to build more harmonic models to inhabit our Planet, increasing the potential for greater achievement of well-being in more holistic forms - beyond its current boundaries of income and consumption.